Tips to Speed up Slow Internet connection. Oh! Why mt Internet is Slow ? Tips to Speed up Slow Internet connection. Slow Internet Connection can be caused by any number of reasons. 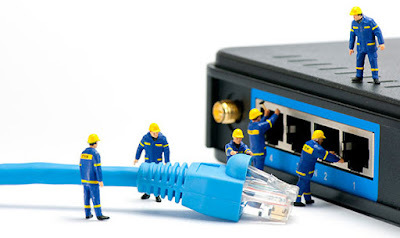 Below is a short list of some of the more common reasons your Internet connection may be slow. As mentioned at the bottom of this page, there is no magic program or tweak to increase your overall Internet speed, and reading this can help you know why. The most common reason your Internet may not be performing sufficiently could be due to spyware and viruses. Spyware interferes with your browser by taking over most of the attention of your Internet connection. It also keeps tabs on your keystrokes, which is why certain functions and actions may seem delayed. The more spyware infecting your computer, the worse the problem becomes. Make sure you have security software installed that can scan for and remove spyware. Viruses install computer codes (almost like a standalone program) and attempts to reproduce until it’s taken over your computer. The first sign of a virus is often in your Internet connection. This is because most viruses are sent via e-mail. The rate in which a virus multiplies causes extremely slow computer performance overall. Keep your anti-virus software running at all times. Sometimes there’s nothing “bad” going on with your computer and your connection is still extremely slow. This could be caused by massive download or upload hogs running on your computer. If you’re uploading or downloading multiple files to a site or online storage, your bandwidth can be greatly reduced, causing a slower Internet connection. For programs like this, you can sometimes set a bandwidth cap in order to continue enjoying adequate Internet speeds. Every now and then, your modem or router is causing the issue. You can always restart your connection to see if the problem is resolved. There are also troubleshooting options with your provider. You may require a replacement for your equipment in order to solve the issue. If a broadband connection is available in your area, and you would like a much more enjoyable experience on the Internet, we highly recommend getting it. See the broadband definition for additional information on this term and the broadband available. Your Internet connection may also be slow due to connection issues. You can perform an Internet speed test to determine if you are getting the speed you should be getting. If your download speed is significantly lower than the speed you should be getting contact your ISP and ask them to run a line test to determine the cause of the speed loss. Note: Many connections (e.g. Cable, DSL, and wireless broadband) have a slower upload speed in comparison with the download speed. If you are having issues with uploading (e.g. doing a video chat) it is a slow upload speed and not the download speed. Depending on the web page or website you are visiting or the download you are receiving, your Internet connection may appear to be slow. The composition of the page or site, including text, images, and videos make a difference on how fast your Internet speed appears to be. No matter how many web services or programs you see advertised, there is no magic program or tweak that is going to increase your actual overall Internet speed. There are some tweaks that can be done and some programs that can help with the speed of downloading certain files or increase your local network speed (not Internet). However, no software program will increase the overall speed of your Internet connection. ||ੴ||ਇੱਕ ਓਅੰਕਾਰ Satnam Shri Waheguru Ji A Web Blog about Product Review, Blogging Tips, Tech Reviews: Tips to Speed up Slow Internet connection.